SAN FRANCISCO, Feb. 06 /CSRwire/ - Sustainable Brands® reveals highlights for its upcoming global flagship conference: SB’18 Vancouver. More than 3,000 brand and business leaders will convene June 4 -7 at the Vancouver Convention Centre in Vancouver, British Columbia to focus on how brands are updating their products and services to meet shifting consumer demands in an evolving economy. Participants will find unparalleled opportunities to connect with world-renowned thought leaders driving sustainability-led change, and collaborate on cutting-edge ideas that will help propel business initiatives forward. 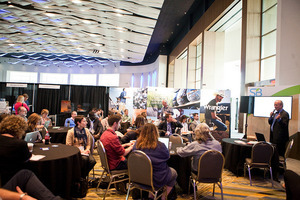 Sitting at the heart of the conference, the Activation Hub will facilitate connections between companies and allow participants to nurture both new and existing relationships. Executives from over 75 brands such as ALDO Group, Sephora, McDonalds, ExxonMobil, P&G, Lowe’s Canada, Dupont and PwC have confirmed attendance to date. Activation Hub pavilions centered around industry sectors include Good Retail hosted by Retail Leaders Industry Association (RILA) and Retail Council of Canada (RCC), Good Homes hosted by SC Johnson, Good Materials featuring Vinyl Business, Good Mobility featuring UNIFI among others. Conference plenary speakers confirmed include Rossann Williams, President of Starbucks Canada, Jill Cress, CMO of National Geographic, Anne-Maria Salonius, Head of Finland Division at Bank of Åland, and Andre Angel, CEO of TangoTab Software. Featured breakout session speakers include Patsy Doerr, Global Head of Corporate Responsibility and Inclusion at Thomson Reuters, Henk Campher, VP of Marketing at Salesforce.org, Doug Munk, Director of New Business Ventures at Nestlé, and Kate White, Professor of Marketing and Behavioral Science at University of British Columbia. Introductory bootcamps led by Kirti Singh, Head of Analytics & Insights at Procter & Gamble, Elisabeth Laville, Chief Entrepreneur at Utopies, Simon Mainwaring, Founder & CEO of WeFirst, and Nadya Zhexembayeva, Chief Reinvention Officer of WE EXIST Reinvention Agency. Sustainable Brands is proud to recognize Nice and Serious as Principal Sponsors, SC Johnson and Clif Bar as Premier Sponsors, and Unifi, Inc., Shaw Industries Group, Inc., VSBC, Cone Communications, LG and Driscoll’s as Major Sponsors. South Pole, the Arbor Day Foundation, Recycle BC and Makersite are Supporting Sponsors. Additional partners include Scientific American, Innovation & Tech Today, Business in Vancouver, Sustainable Packaging Coalition, and the Conference Board of Canada. SB’18 Vancouver is scheduled for June 4-7, 2018 at the Vancouver Convention Centre in Vancouver, British Columbia. Register now to participate and find the partners and tools needed to secure competitive advantage in a changing marketplace. Best available pricing ends February 16th. Speaker and sponsorship opportunities are now available for those with breakthrough ideas, tools and technologies that support business success in sustainability. For more information about attending, speaking or sponsoring SB’18 Vancouver, please visit www.SB18Vancouver.com or email connect@sustainablebrands.com.